One of the best aspects of being a pen reviewer is getting to learn about new makers and companies as they come along. In an industry making products no longer at the forefront of most people’s lives, it can be surprisingly easy never to get in front of the people who might want your products. So, when I get a chance to try a new pen from a largely unknown company, it gets me excited. DeNobil Pens is one of those companies. Based in the Republic of Moldova, DeNobil has introduced their first few models of pens in what I hope will become a large line of writing instruments. They seem to have opted for the Henry Ford model of material selection: you can have any color you want so long as it is black ebonite. The review model DeNobil sent to me is their flagship model, the 300. 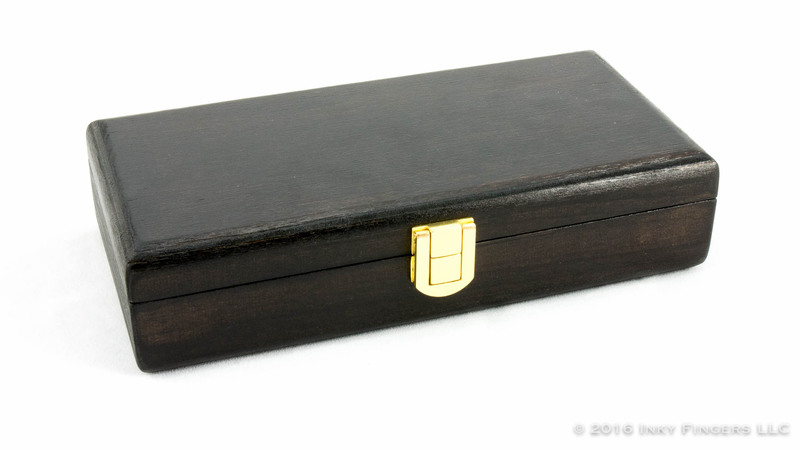 The pen comes in a dark-stained wooden box with gold clasps on the front holding it closed. It is a nice presentation that feels a bit more craftsman-made than the mass-produced clamshell boxes you get from a lot of other manufacturers. 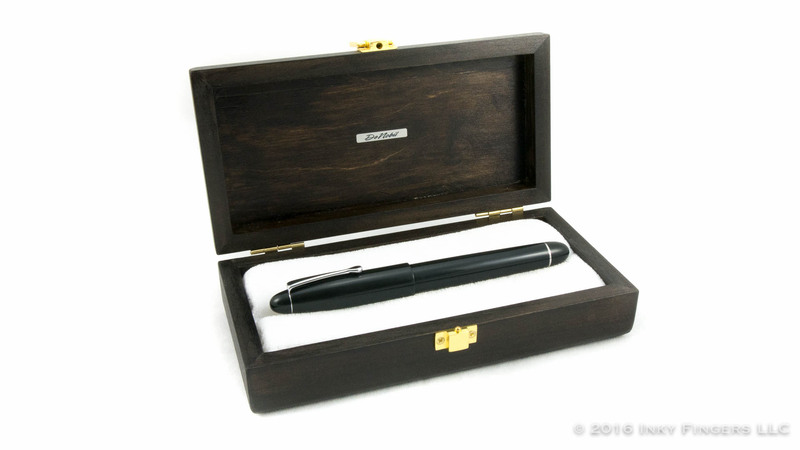 Inside the wooden box, the pen rests on a bed of white, velour-like fabric. 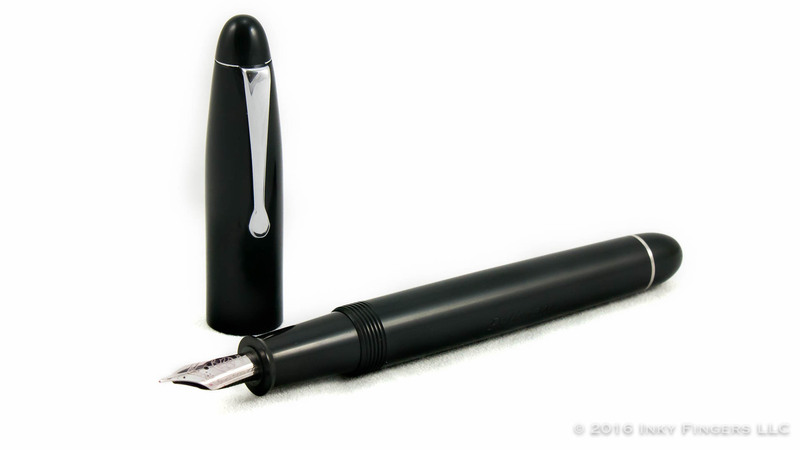 The DeNobil 300 itself is a large, cigar-shaped pen with silver-colored trim. 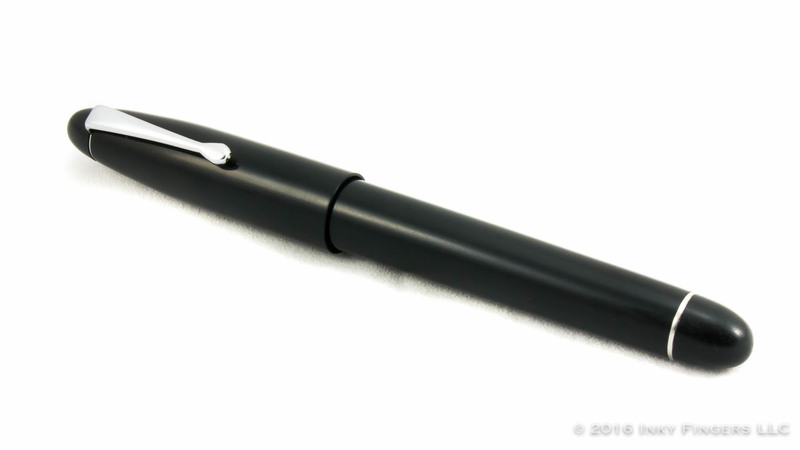 The pen’s shape is the very definition of classic and understated…save for its massive size. 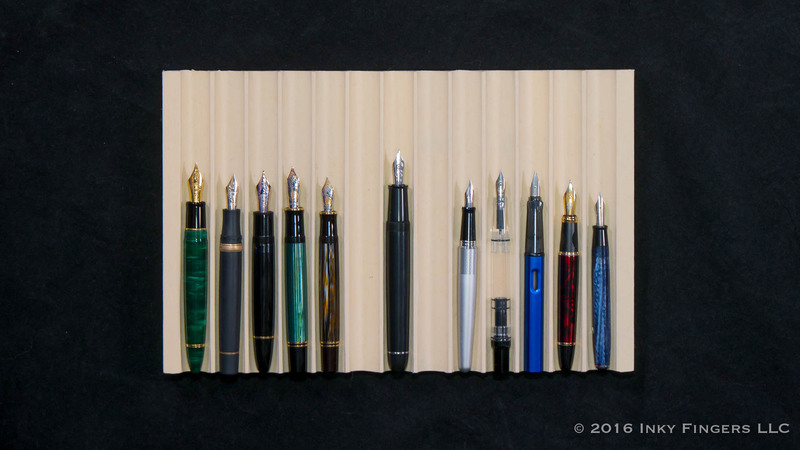 The 300 is significantly larger than any of my other pens, including the Montblanc 149 or the Pelikan M1000. 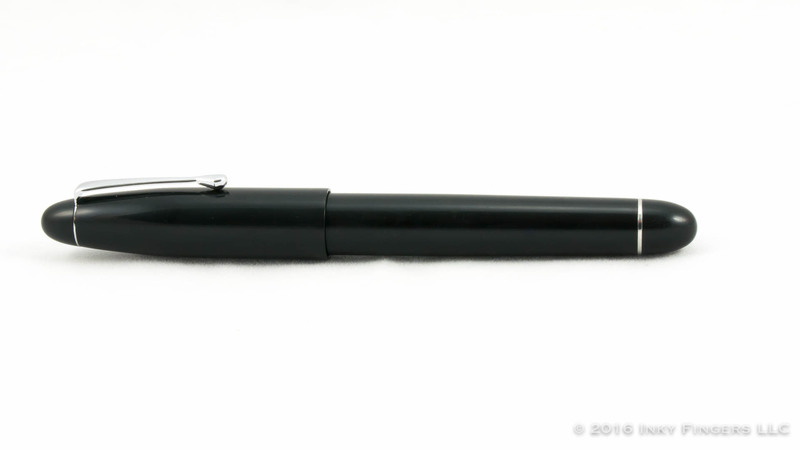 It is not so large, especially in the section, that it is unusable; but unless you have huge hands, this pen will look a bit out of proportion. The cap starts with rounded point finial which holds on the very traditionally-shaped, silver-colored clip. The folded-metal clip is springy, but still sturdy. The remainder of the cap flares out at an angle then evens out into a cylindrical shape. The lip of the cap doesn’t have a cap band, but was turned to be thick enough not to feel too delicate. The barrel is a near-cylinder onto which the DeNobil 300 logo has been laser-engraved. 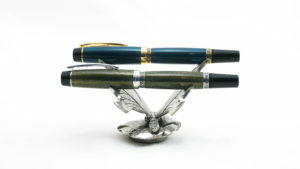 The pen then terminates with a silver-colored washer and another rounded finial to echo the design at the top of the pen. Overall, the finish on this pen is well-done. 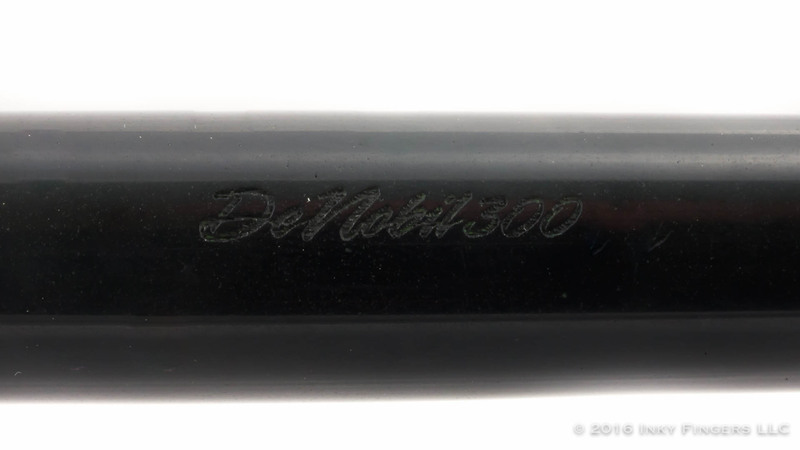 The DeNobil 300 is made of high-quality ebonite that is blessedly free of any major pitting or inclusions. 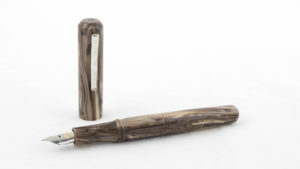 The pen has been nicely sanded and polished, and shows no tooling marks from the turning. The only real downside is that this nice, glossy finish tends to be something of a fingerprint magnet; unless you wipe it down occasionally, the pen does tend to lose a bit of its gloss. If there was one manufacturing choice which was disappointing, it was the threading used to secure the twist-on cap. 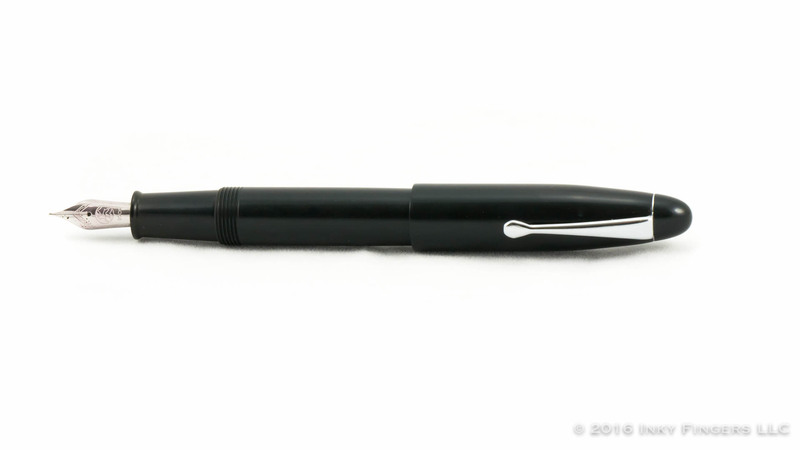 DeNobil has opted for a single-start thread that ensures the pen can only screw on in one position. The downside of that design decision is that it takes four full turns of the cap to remove it–too much for any pen you need to cap or uncap frequently. 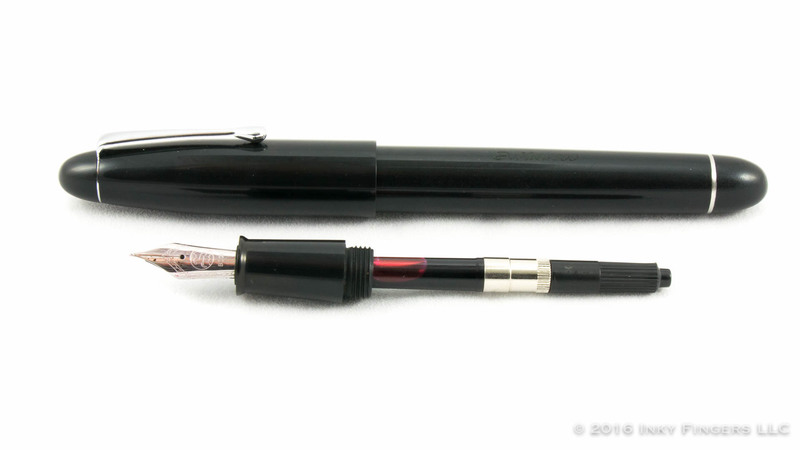 Under the cap is a tapered section, which despite its ergonomics, is still quite large, measuring at around 13mm in the middle—the same width as the Montblanc 149’s more cylindrical section. 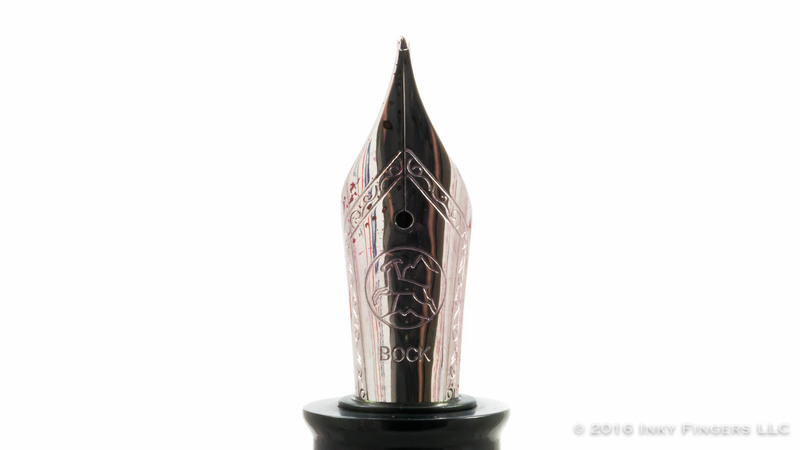 The pen features a Bock-branded #6 steel nib, which screws into the section. 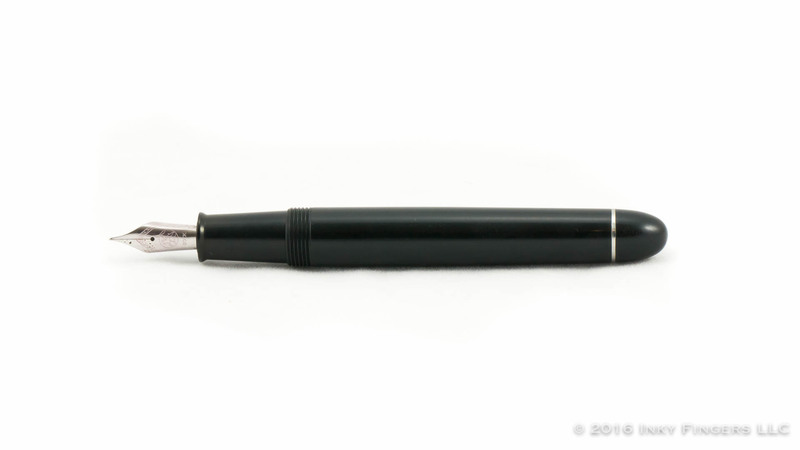 With a pen this large, a #6 nib does tend to feel a little on the small size, but not so much as to look ridiculous. I do think that this large pen would have benefitted from a #8-sized nib instead, however. The pen accepts standard international cartridges and converters, and comes with one of the highest-quality converters I have ever used. 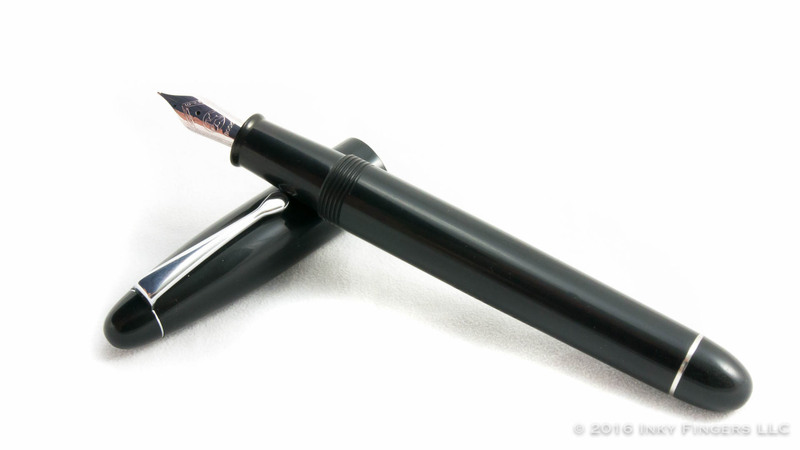 The section’s tenon is made of ebonite as well, which means the pen can be used as an eyedropper if you desired. I have reviewed several handmade ebonite pens from smaller manufacturers in the past, and I have liked many of them. What a lot of them lack, however, is an attention to detail that can match the quality you might find from a larger-scale industrial manufacturer. That is not a problem with the DeNobil 300, which features a very precise and quality construction. 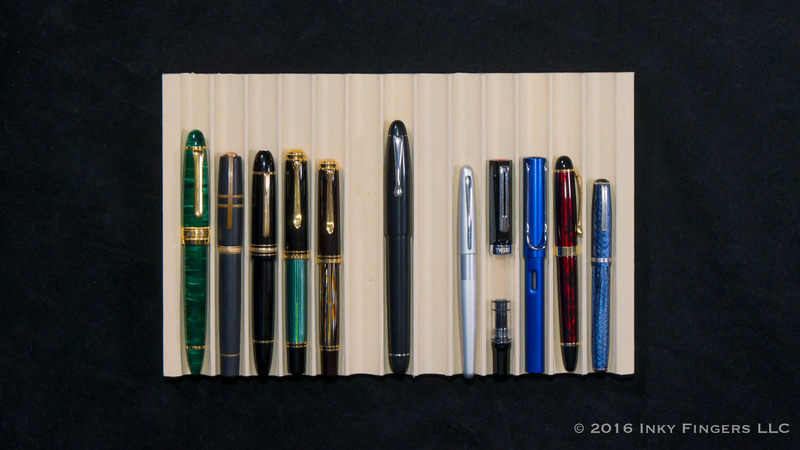 While the pen does still maintain the feel of a hand-crafted instrument, the fit and finish are comparable more to the workmanship of the custom pen makers I’ve reviewed than to some of the manufacturers like Gama, Asa, or Ranga. The threads are smoother, the tolerances tight. The quality of construction aside, however, I find the design of the pen somewhat uninspired. 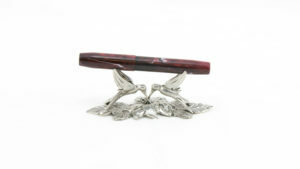 Visually, there is nothing unique or innovative to help this particular pen stand out from the myriad other black, cigar-shaped pens currently on the market. DeNobil, at least so far, has opted to aim for very classic designs. I think that limits their appeal to a smaller segment of the market. Fortunately, though their initial models are more restrained and classic, those models have been well done. The DeNobil 300’s writing performance is good, if relatively standard. 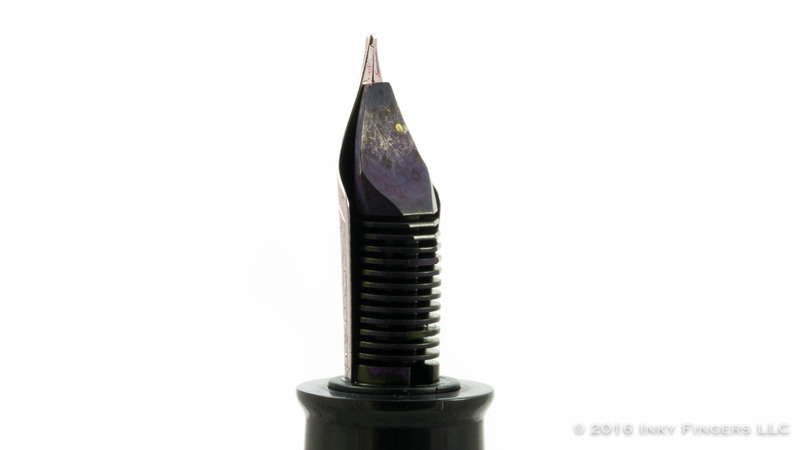 The #6 Bock nib is rigid, but smooth, with an ink flow that falls slightly on the dry side of moderate. My medium nib was well-aligned, and resulted in a line fully in keeping with my expectations of “Medium” from a western nib. For a workhorse nib, it is an excellent choice. It is just a bit lacking in any sort of expressive personality. The DeNobil 300 lists for $199 and is available (as far as I know) only from their shop. As of the time of this writing is is listed for sale at $159.00. This places the 300 in, I believe, a very nice price point. At $159, the DeNobil 300 is in the same general price range as many of Franklin-Christoph’s or Edison’s offerings. The fact that is is ebonite sets it apart from either of those two manufacturers, neither of whom use ebonite in their production lines. (It also comes with a slightly nicer presentation.) 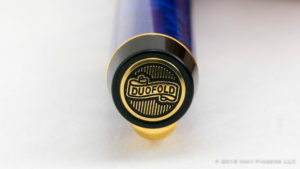 DeNobil appears to use a higher-quality ebonite than many other lower-end makers of ebonite pens, and they seem to do a better job in finishing it. I can imagine the DeNobil 300 being a really solid alternative for someone who would enjoy using a Sailor King of Pen, but for only 15% of the price. 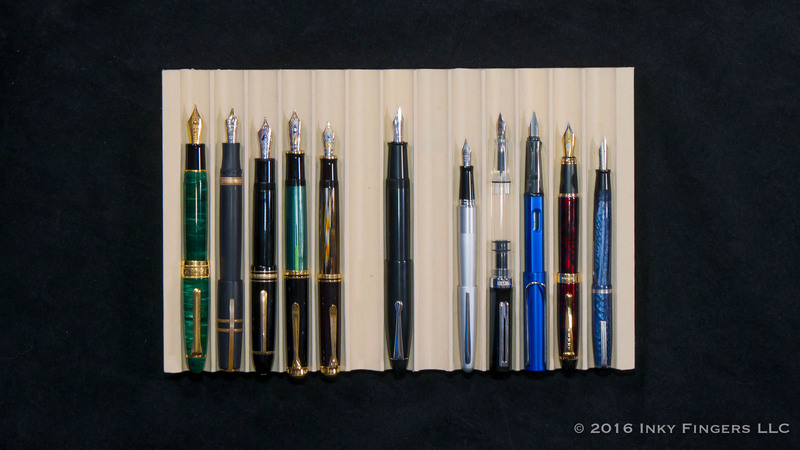 This is a great, budget-conscious alternative for someone who enjoys understated, classic, yet large, pens. I think DeNobil has made an interesting entry into the fountain pen industry. As they become more established, I hope to see a wider variety of materials and pen sizes from them, which I feel will likely appeal to a wider range of pen users. But as a starting point, they have done a nice job of making a classic, understated pen from good materials and with fine craftsmanship. You can’t ask for much more than that. The pen for this review was provided free of charge by DeNobil pens. No additional compensation was provided. All opinions expressed herein are my own. This pen will be a prize in a future Pen Habit giveaway.